First and foremost, you’ll need a specific email address to subscribe to the mailing lists with. This can be a dedicated email address that is an alias of your actual address (this is the route I went with), or you can simply use a modifier on your email address by adding ‘+list’ to the end of the local part of the address (the part before the @ symbol). ‘list’ can be anything you want. 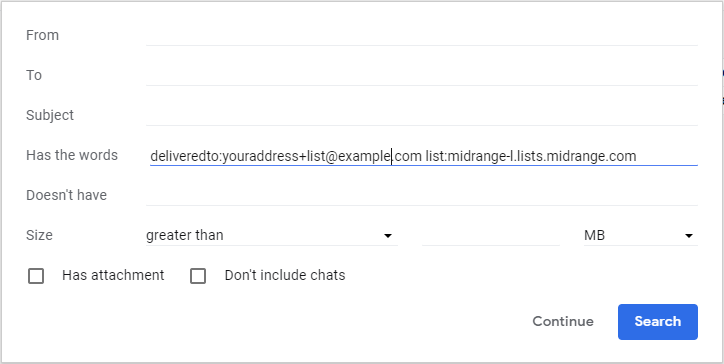 If you use the ‘+list’ method, you’ll need to be subscribed to the list twice … once with your normal email address, with mail delivery disabled, and also with the tagged address with mail delivery enabled. So you need to create a compound rule … one indicating the address the address the message was delivered to (not the from or two), and the second one to identify the actual mailing list the message is from. Here you can set what you want to happen when the message is delivered. 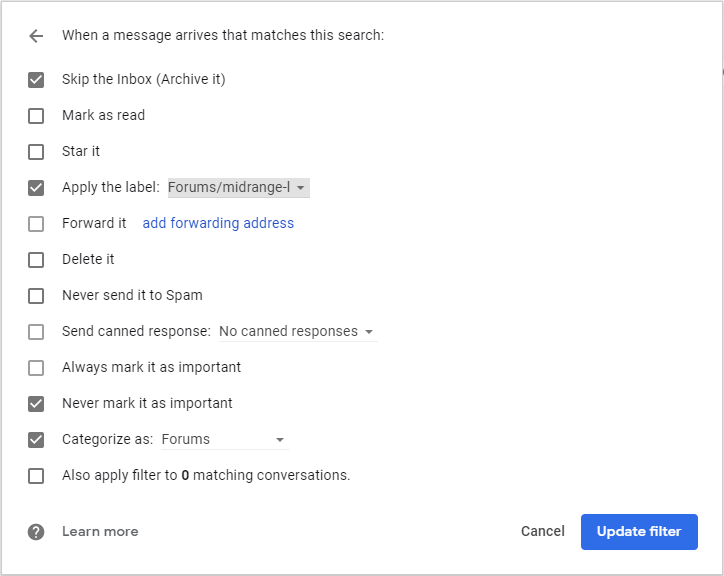 I usually have the message skip the inbox, so it doesn’t alert me on my phone or mail client, apply a label to identify the message from a specific mailing list, and also categorize it as a forum message. This technique does a nice job of keeping my mailboxes tidy.